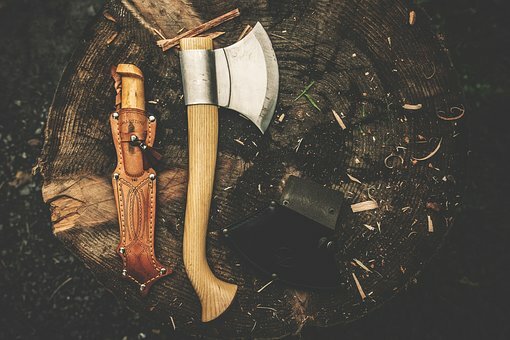 What are the best survival tools? This an excellent question and one that shows up quite often in wilderness survival and prepping community forums and discussions. Before I introduce “the best survival tools” to bring in the wilderness, I want to identify the geographical area, that these tools are being used in. These survival tools and the skills they require, to perform effectively, have been used in the forested mountains and along the rivers of western Canada, from 49°N. latitude to 60°N. Latitude. They are not restricted to this geographical area only, however, this is the area where I have used them and continue to use them to this day. I also want to mention that these tools can serve campers, hikers, fishermen, hunters, mineral prospectors and all similar forms of outdoor activity. We have all seen lists of the 10 essentials and versions of these, ad nauseam. I like the number 10. We all have 10 fingers and 10 toes. The metric system is based on 10 as well, so here is my list of the 10 essential tools and skills that I carry with me in all wilderness settings. I will introduce them in no particular order, because from my personal experience, their degree of importance can vary quite a lot, depending on the situation that I find myself in. Let me give you a few examples to show you what I mean. Is fire building more important than safe drinking water? Is shelter more important than having safe drinking water? These are all very good questions that deserve equally good answers. No one who spends time in the wilderness, whether this time is spent working or playing, will disagree, that fire, drinking water, and shelter are not important skills to learn and master. Thus, my reasons for their order of rank. My four-season outdoor experience has convinced me that these 3 tools and the skill sets they require are the ones that have been of greatest benefit to me in all situations. These 3 skills and their accompanying tools, are a must for you to learn and practice, at home and in the outdoor setting, so that you are able to master them and feel confident in their use. The reason I want to limit these tools and skills to these three is for simplicity. I also want to mention that these three skills are directed primarily at novice and intermediate level users, and by breaking these tools and skills into a 3- part series, it will be less intimidating and much easier to understand and learn. If you are a seasoned wilderness professional or a veteran adventurer, you know that these three skills are the ones you will be jumping on first if you have to spend an unexpected night under the stars. When you realize that you will be spending the night in the forest or on the side of a mountain, your first and most important task is to begin building your shelter. The major part of this construction should be done before darkness sets in. Bonus points for you if you have a quality headlamp. Today’s headlamps offer superior illumination and this effectively solves the night time and darkness factor, in this equation. Before you get too carried away with building your shelter, I want to bring your attention to No. 2 and No. 3, … fire and water! Ideally, and if at all possible, you want to build this shelter near a source of water and in a location where there is plenty of fire building material. The ability to keep your fire going all night is extremely important if you are in heavy rains or frost and snow conditions. Shelter building on a starry summer night under the full moon and building a shelter in rainy, windy, or winter conditions are two completely different exercises. 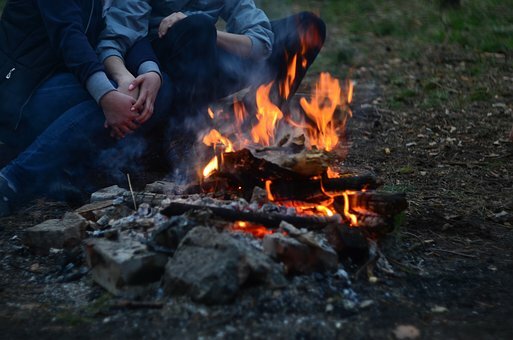 On a clear mid-summer night in warm conditions, if your fire dies out, you will at most wake up with a chill, however, with no protection from rain, frost or snow and no fire to maintain proper core body temperature, you may not wake up at all. Now, let’s see what you have in your backpack. These 3 tools and items should be neatly stored and be an integral part of your survival kit. 3) cutting tools – a knife, an ax and a saw. These tools and things, make it very easy to set up a ridge pole or rope to serve as a support for this shelter. Your exact location will determine the configuration of this piece of material. Pin the sides down and voilà, you are now under cover. Hopefully, you are on a fairly level, dry piece of land. Try to not build your shelter in low-lying areas as the air will be much colder here. Another useful technique to learn is building the fire inside your shelter. This, of course, requires a slightly larger space and an opening in the roof so that the smoke can escape. It also requires a more controlled fire and careful preparation that is only be achieved through practice and experience. Now that you are sitting comfortably under a shelter, let’s explore building a fire. tinder, … in the evergreen forest, this can be dried spruce needles at the base of a tree, small twigs, pitch or dry Birch bark. Pitch is an excellent tinder and is the white or yellow, the gum-like substance found oozing on the trunks of coniferous trees. the fuel … these are the larger pieces of wood that will serve to keep your fire burning and producing Heat! Three simple tips to help you stay warm all night! I often place long, small diameter ( 4-6 inches ) trees into my fire uncut. I put the tips of these trees into my fire and slowly feed them in as they burn off. This saves me a lot of time cutting them into shorter lengths and half a dozen of these trees will keep my fire burning all night. Dead, standing trees are usually the driest and their branches also make great kindling. These long pieces of firewood will help you get longer periods of sleep. Your fire has to burn steadily and be under control so that you can get some sleep, stay warm and not catch yourself or your shelter, or the mountainside, on fire. By now, you are getting quite comfortable, and this will be a very pleasant night under the stars. Reaching into your bag again, you come up with a clear, see-through, Nalgene water bottle, nestled into a metal container or pot. Your bottle is almost full and that bubbling creek is not that far away. I prefer a clear, large diameter, medical grade bottle. The reason for this large diameter is that it pairs exactly with the hydration bag in my expedition-style backpack and to my water filtering tool. A clear bottle is the only way to see the inside of my the bottle. It is the only way to verify that the inside of my drinking bottle is clean and free of funny stuff. No opaque or solid colored plastic or metal bottles for me, if I can help it. These two very basic items enable you to gather water and boil it. Boiling your water will disinfect it and make it safe to drink, under most conditions. Another very useful and inexpensive tool to maintain a safe drinking water supply is the LifeStraw. Finding water and ensuring that it is safe to drink cannot be overly emphasized. It is one of the most important skills you can learn. This is a 3-part series. It will be very easy to follow and simple to learn. These skills are easy to learn and the tools and equipment required are inexpensive. The time to gather this equipment and learn their proper use is before you find yourself in an emergency situation. Practice these skills on pleasant days in relaxed conditions. Practice will help you gain confidence and this confidence training is what will enable you to turn chaos into calm and control. These skills can save your life! If you have any comments, questions, or suggestions, please do not hesitate to Contact Me. I will do my best to answer them all in a timely manner. Your survival will depend on your situation and what needs to be done. Shelter, clean water to drink and fire are definitely three essential things to consider when choosing your survival tools. I look forward to read the other two parts. Thanks, Dinh, for your comments. The essentials and the ability to assess your situation, in a wilderness setting, are a great confidence builder. Happy to hear that you will be reading parts 2 and 3. Love the site, Paul. Your basic survival tool post is well-thought-out and it makes perfect sense. Obviously you have been doing this stuff for a while! I agree that knowing how to provide yourself with shelter, fire and safe water are the most important skills to focus on. There’s nothing better than having someone knowledgeable show you HOW to use your tools properly so the videos would probably be a great addition to your site. Thank you so much for the visit Netta . I am in agreement with you … one picture , a moving picture … is worth a thousand words . This is the next phase of my website development and one that I am presently engaged in . I hope to have these videos out shortly so that you are able to enjoy them as well . 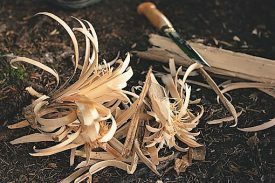 Such a cool article on best survival tools, I always wished I knew how to survive with as little as possible you never know when those skills would save your life. I do love all the cool survival tools available, you really do know your stuff about survival so intense description what you need and how to do what you need to survive. Where did you learn so much about survival tools, did you take some training or learn on your own? Thanks Jeffrey for the wonderful comment . Wilderness Survival is interesting in that it promotes self-sufficiency , and of course it’s practiced in the beauty of Nature . My first knowledge was acquired from my parents and friends , later from reading and studies and finally , I spend a great amount of time in the outdoors where I practice these skills . I have many other articles on my site that you may be interested in . There are 2 other parts to this series that make it quite complete and are an excellent introduction to this exciting world . Hiking is always an easy way to get started and I have posts with very ” complete ” lists of easy to acquire gear to make your adventures safe and fun . Hope to hear from you again soon . What an useful set of information here, thanks a lot! I love going in the wilderness but I always stay just for the day as I have no survival skills nor any specific knowledge on what to do if things are not exactly as in a hotel. I shall study all the content in this website and see what happens next time I go in the mountains, Iâ€™m sure Iâ€™ll enjoy the trip much more! Thanks again, and keep giving us all the tips that you know of please. Thanks for the visit Alma . Your love of the wilderness will serve you well in improving your skill set . As in all other areas of life , improvements come with experience and practice . Visits of reading/studying sites such as this one ( and others) , will provide lots of wilderness survival tips to make your adventures safer and more enjoyable . Have a look at parts 2 and 3 for more interesting tips !